As part of its ongoing efforts to help and support those affected by the Marawi conflict, mobile services provider Smart Communications has opened up its network to provide free calls and texts catering to Marawi residents affected and displaced by the ongoing crisis. 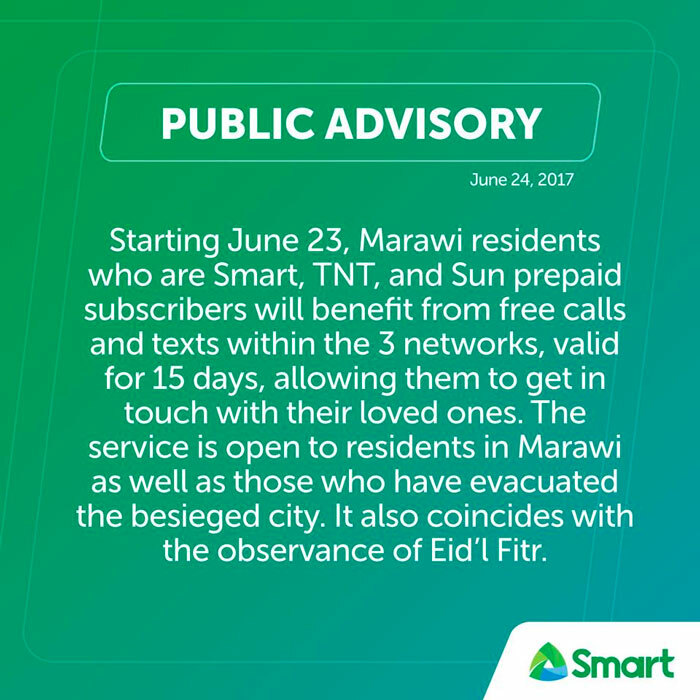 Starting on June 23, Friday, Marawi residents who are Smart, TNT, and Sun prepaid subscribers will benefit from free calls and texts within the three networks, valid for 15 days, allowing them to get in touch with their loved ones. The service also coincides with the observance of Eid’l Fitr, or the end of Ramadan, on June 26, Monday. The public service is open to residents still caught in Marawi City, as well as residents who have evacuated the besieged area. Eligible Smart, TNT, and Sun subscribers shall receive a notification within the next few days to inform them how they can avail of the call and text services without incurring charges. “We realize that mobile communication serves as a vital lifeline in disaster and crisis situations. By providing our special service to those affected by the ongoing conflict in Marawi, we enable our brothers and sisters to reconnect with their loved ones and draw strength from each other in these trying times,” said Ramon R. Isberto, PLDT and Smart Public Affairs Head. Smart’s call and text services are part of the PLDT group’s ongoing efforts to support government and military operations, and help those affected by the conflict not just in Marawi City but also in neighboring areas, where most of the residents have gone to for help and safety. Smart has put up Libreng Tawag stations at evacuation centers in Iligan City, and assisted in distributing relief goods and personal hygiene kits at evacuation centers in Lanao del Norte. Smart has also donated Php2 million worth of mobile services to soldiers deployed in Marawi, and has teamed up with the Armed Forces of the Philippines to provide communications support to civil military operations and rescue groups. Smart, along with PLDT, is also providing Internet connectivity at the National Disaster Risk Reduction and Management Council Operations Center in Iligan City.